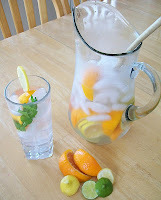 Angelique: New Age Weight Loss Tip #14 is DRINK WATER NOT JUICE. Mom: Back in my day, we drank kool-aid, ice tea and juice. Maybe once a week, I'd go to the corner store and get a Fanta Pineapple, but that was a luxury. Angelique: In the new age, we are drinking tons and tons of soda. And a healthy alternative for most of us is juice. Mom: The truth is the juice has just as much sugar and isn't much healthier than drinking soda. Plus both of them are packing on the pounds. Angelique: That's why I say DRINK WATER. Mom: That large soda or sweet tea at lunch is equivalent to a small meal. 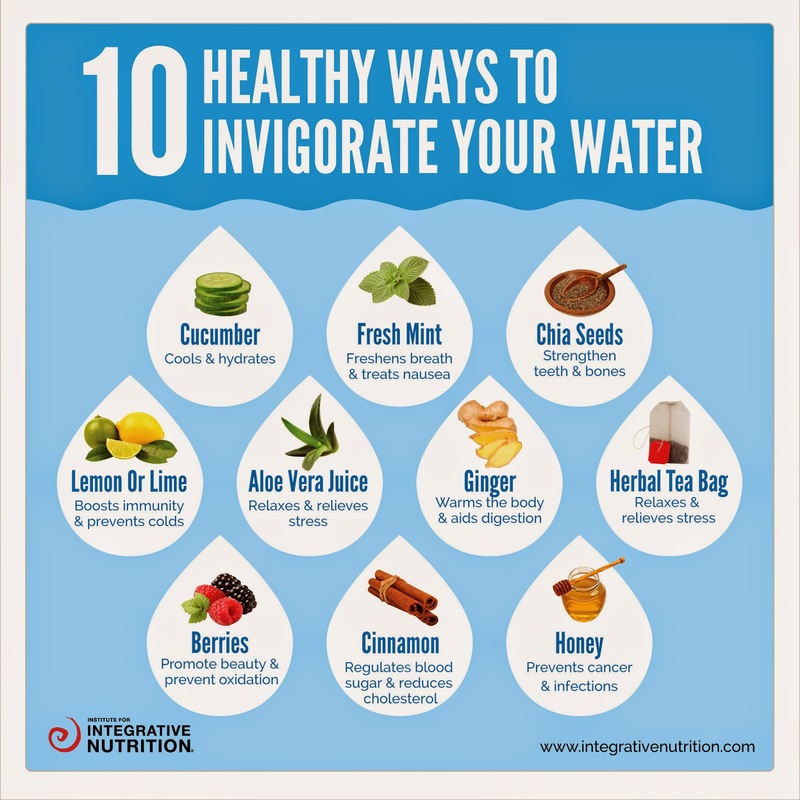 Angelique: WATER not only has zero calories, but it helps you feel full quicker, helps stop hunger pains when you're not really hungry and it helps keep the system flushed out. Mom: Before you stop to remind us that Coke has zero calories too, I'm going to remind you that we have no idea what's in nutra sweet or any of the other fake sweeteners that have hit the market over the past 30 years. Angelique: I'm still shocked that saccharin says clear as day on the wrapper that it causes cancer and people still use it. I'm more shocked at the number of ailments being caused by nutrasweet that magically stop when people stop consuming it. But back to weight loss. Mom: It won't be easy cutting off your favorite juices and sodas. The sugar in them is said to be as addictive as heroine. That's why you drink one drink after the next and your thirst is never quite satisfied. Angelique: But once you quit, watch that big gut magically start to go down. I've seen it over and over again. Mom: And if you hate water like I do, here's a tip that made me love it. 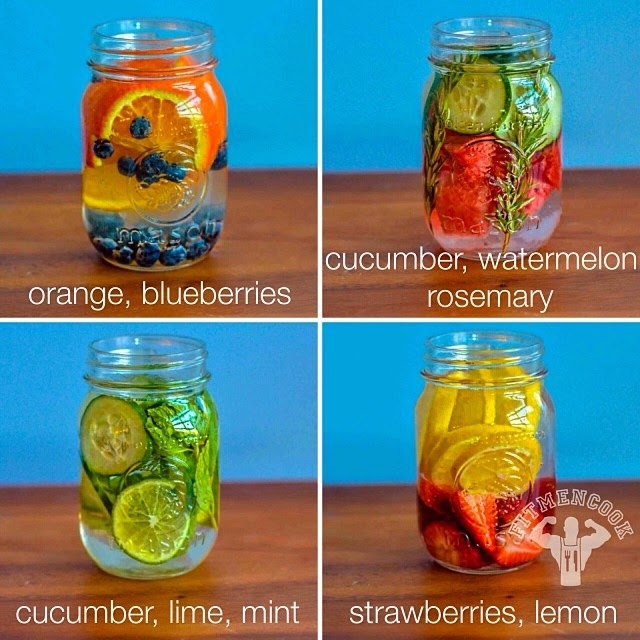 Place all ingredients in a glass jar with a lid. 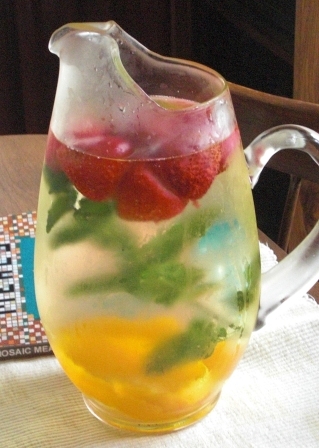 Refrigerate for at least an hour before drinking. Refill container three time or when strawberries loose their color. 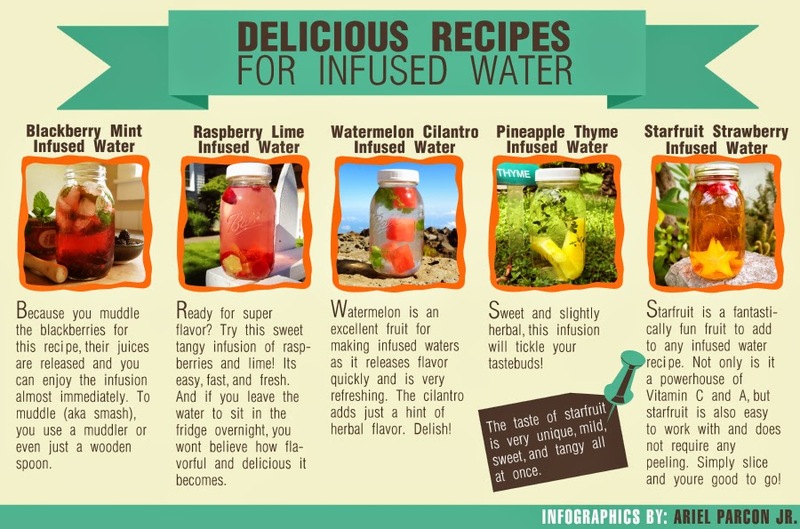 You can use almost any fruit, green herbs, celery, cucumbers, fennel, and a host of vegetables. If you don’t trust your judgment, try it by the glass first. Some people even squeeze/puree ingredients before adding then to their water. Smoothie Tip: Avoid adding sugar, dairy or large volumes of seeds, oils, nuts or any supplements whatsoever to your green smoothies. 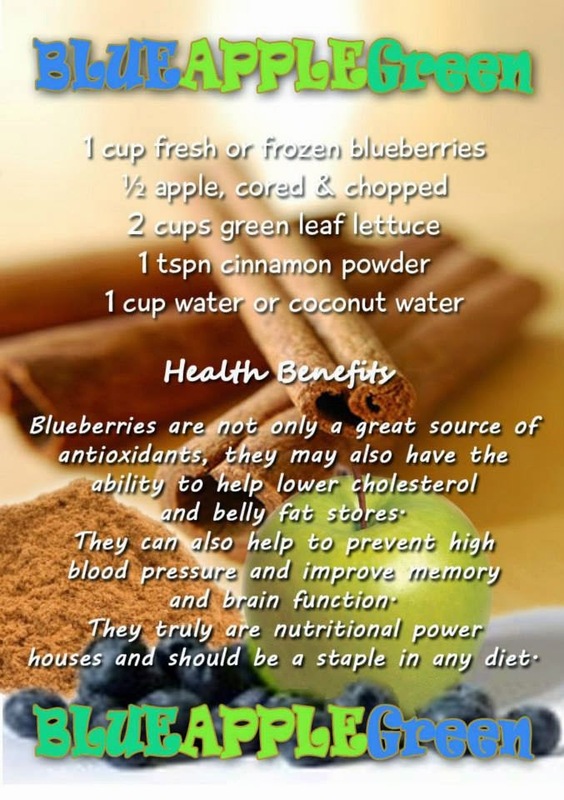 Place liquid, frozen blueberries and cinnamon in a blender and process 30 seconds. Add the apple and lettuce and continue processing until smooth and creamy. You know I am not a great advocate of supermarkets anymore, but when I stepped into the new Ralphs in Sherman Oaks, CA, I was pleasantly surprised. It was a combination of every specialty store I’ve ever visited. In it, I saw Whole Foods Market, Gelson’s, Santa Monica’s Co-opportunity and even the east coast Fairway Markets plus more all rolled into one State-of-the-Art Supermarket. This Ralphs definitely has to be the prototype for supermarkets of the future. The produce department was massive and beautiful. Yes beautiful! The way everything was arranged was actually breath taking. I felt as excited as a kid in a candy store. The first place I headed to was the Organic section; it was one of the largest I have seen in a supermarket. And I was really pleased to know that 75% of the organics was grown right here in California’s San Joaquin Valley. This made me very happy because I feel like I’m still supporting local farmers even though I am not at the farmers markets. Kudos to you Ralphs, you’re giving us the best of both worlds! I must mention the Fresh Herb section, which is unbelievable. It’s not some small little display of herbs tossed in a plastic wrapping. It’s a whole section of loose fresh herbs. One more thing I’d like to mention before moving pass the produce department is the variety of Tropical produce they have like quinces, baby pineapples, pepinos and more. I am going to call the Meat and Seafood section the Butcher shop. The selection of organic and natural chicken and beef is the largest I have seen. Normally I have to go to a couple different markets to get fresh organic or even natural meats. And can you believe they will even fry your fish for you? As I advanced around the store, I observed that every department was breathtaking and unique in its layout and design. The floral department was not a supermarket floral department; it was a florist shop precisely laid out and color coordinated. My only word is GORGEOUS! In the home goods area I felt like I was in Bed Bath and Beyond. They have everything from sink strainers to high speed blenders and juicers. Another thing that really impressed me was their kosher area. I felt like I was in a Jewish Deli/Bakery. They had kosher meats, seafood, cakes/pastries, cold cuts and even hot food. I was really surprised to find that they actually had a Mashgiach (supervisor who instructs and inspects the kosher status of food preparation) on site. When I was in their conventional deli/bakery area, I felt like I was in a NY deli. The fresh baked breads, cookies and the NY bagels are delicious. I have to mention the Boars head cold cuts and the cheese shop are unbelievable. They have so many different specialty cheeses. Overall, my daughter and I are big fans of the new Ralphs in Sherman Oaks. They know what this neighborhood wants. We want fresh, healthy food at a reasonable price. They know what we need. We need it convenient, high quality, some of us need it gluten free, kosher or organic. They know what we like. We are progressive people who want to protect the environment and support our community. Ralphs Sherman Oaks returns us to the good old days when the butcher knew your name and could cut your steak just the way you liked while advancing us into the future where your child’s gluten-free birthday cake is just one call away.